Control your radio system from a remote office with ICOM RC-FS10 remote communicator. 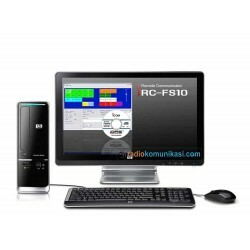 It creates a virtual radio/dispatcher on a Windows® PC. The PC software provides a minimum set of programmable dispatcher console-like functions, like simple repeater control. The communicator allows for scalable capacity. One remote communicator can connect up to 8 repeaters, or 8 remote communicators can connect to one repeater. The PC software will provide a set of programmable dispatcher console-like functions, as well as simple repeater control such as channel changing capability. The software is easy to use with a flexible button layout on the PC monitor. Users can program capabilities found in subscriber units on their PC like stun, revive, emergency, status, etc. Users can also log calls and text messages to other users (up to 10 characters). There are also three levels of password security. Radio over IP (RoIP) is an expanded version of VoIP, transmitting the radio control signals such as PTT and COR in digital format in addition to the digital voice packets. With RoIP it is possible to offer end to end digital signaling from a handset to any other communications device in the world. RoIP technology eliminates the leased lines previously used to remotely control base stations by tones and, in a RoIP digital implementation there are no conversions from E&M to IP limiting the controls signals available or delaying the speed of signaling. Of course true end to end digital signaling and communications also facilitates end to end encryption for secure communications. Included with the RC-FS10 is the CT-24 USB vocoder unit. The CT-24 is a digital voice converter unit, which digitally compresses the voice into a digital data stream. It also has an ESN used for unit identification. The optional CT-23, desktop microphone adapter, allows the user to attach the SM-26 desktop mic or an HM-152 speaker microphone to the computer. The microphone will work just like it would be used. The PTT function is provided by a screen button in case a PC headset is used. DSK/API documentation for third party software developers is available under agreement. Contact Icom America for details. 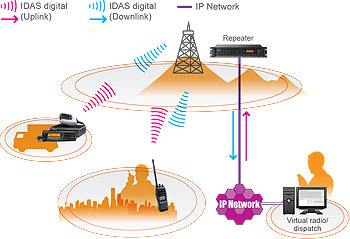 For dispatch desks in large, multi-storied or remote buildings where non-IP radio connections from the base radio to the main antenna would be inefficient, overly expensive or not possible. single site systemUse the RC-FS10 on a laptop and reach back to the repeater while away from the office. Also applicable for companies with the dispatch locations far distant from the rest of the radio system. One company with multiple branch sites and multiple repeaters who want to control everything remotely, whether across town or from around the globe. Up to 16 IDAS repeaters (sites) can work on one network. One RC controls up to 8 IDAS repeaters. 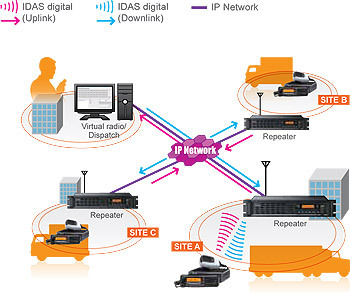 One IDAS repeater can be connected to up to 8 RCs. Connect up to 128 RC units within an IDAS network. 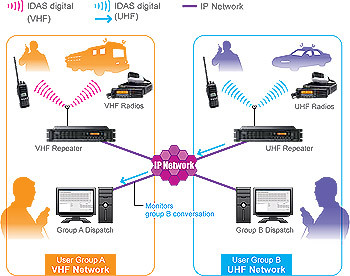 Connecting different radio systems, even those using different frequency bands, via IP to achieve seamless voice and data communications.